Here at Quintain, our staff is pretty competitive by nature. 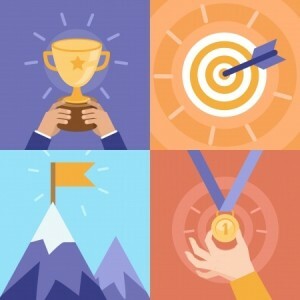 Whether we’re competing in marathons, triathlons or other fun activities that give us a competitive edge (you should have seen us when we went bowling as a team! ), we’re always looking for ways to push ourselves to do better. We apply this same competitive spirit to the work we do for our clients to ensure they’re at the cutting edge of their industries and stand out from the competition. When our clients ask: “How are we doing versus [name of competitor here]?” we have an answer for them and can show them, in measurable detail, how their marketing stacks up. While we have a pretty tight process for tracking how our clients are doing compared with their competitors, it’s really not that hard for you to do the same. 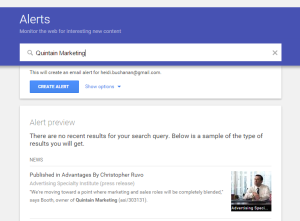 Set up a Google alert for your competitor (and do this for your own company if you haven’t already) and for any keywords that might be relevant to them. This should include the company name, but could also include alerts for product names, the names of top executives, etc.. This is a great way to make sure you’ll be notified the minute they are mentioned in the press or online. You can choose to receive Google Alerts immediately, but I prefer to get them once a day so my inbox doesn’t get too cluttered. Watching what your competition posts on social media is a great way to gain insight into what your competition is focused on, whether they’ve experienced any big wins, or if they are launching a new product or service. Nobody has the time to surf Facebook, LinkedIn, and Twitter every day for this information, but the good news is that there are a number of tools you can use to automate this process. We use Hubspot to set up monitoring streams (similar to a Google Alert, but for social media) and configure it to email us daily any time there is a discussion around the topics, people or companies we’re watching. 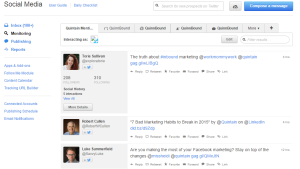 You can accomplish something similar in HootSuite by creating customer streams. 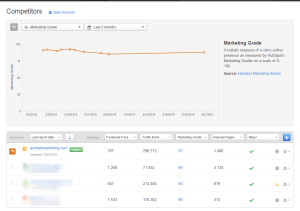 In addition to providing users with a robust set of social media monitoring tools, Hubspot has an awesome competitive reporting tool that tells you how your competitors score when it comes to traffic ranking, Marketing Grade, social media followers, MozRank and indexed pages. 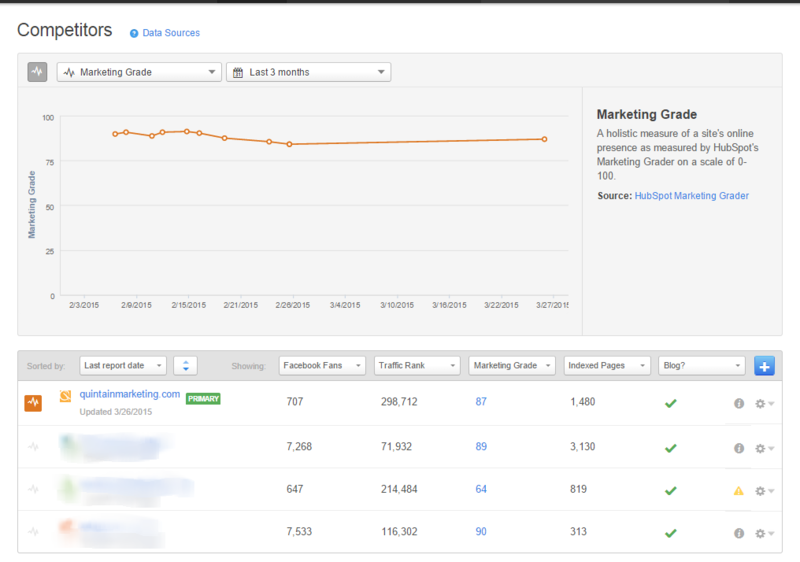 If you’re not a HubSpot customer, use the company’s free Marketing Grader tool to rank your own marketing, and then run your competitor’s sites through it as well. If you’re tracking your competitor’s marketing rpeorts frequently, you’ll know as soon as any issues arise and you’ll be able to tackle them in a timely manner. My husband once complained about the enormous volume of email he receives on a daily basis. He was an eCampaign manager on a political campaign at the time, and I asked him why he was receiving so many emails from candidates who were nowhere near his race. He said he liked to know what the competition was doing. Plus, once you’re on one list you somehow manage to end up on hundreds. But what he said about keeping up with the competition makes sense. I try to stay up on this with my clients’ competitors so that I can make sure we’re doing the best work we can do – which is of course, better than their competitors when it comes to marketing. You can do the same. I recommend that you create a separate email address for this (I like Gmail) so that all those competitor emails stay separate from your primary inbox and your competitors don’t remove you from their lists when they see your email sending domain. Did your competitor get a fancy new website redesign? Maybe they started a blog or stopped offering a service (or worse, added a new service!). How would you know if you’re not looking at their website frequently? Make it a habit to regularly check out your competitors to stay up to date with their news and service offerings. Getting found online all comes down to keywords. Specifically, search engine optimization is all about using the right keywords frequently and in a way that is natural, not forced. How do you do this? By creating great content that incorporates those keywords. 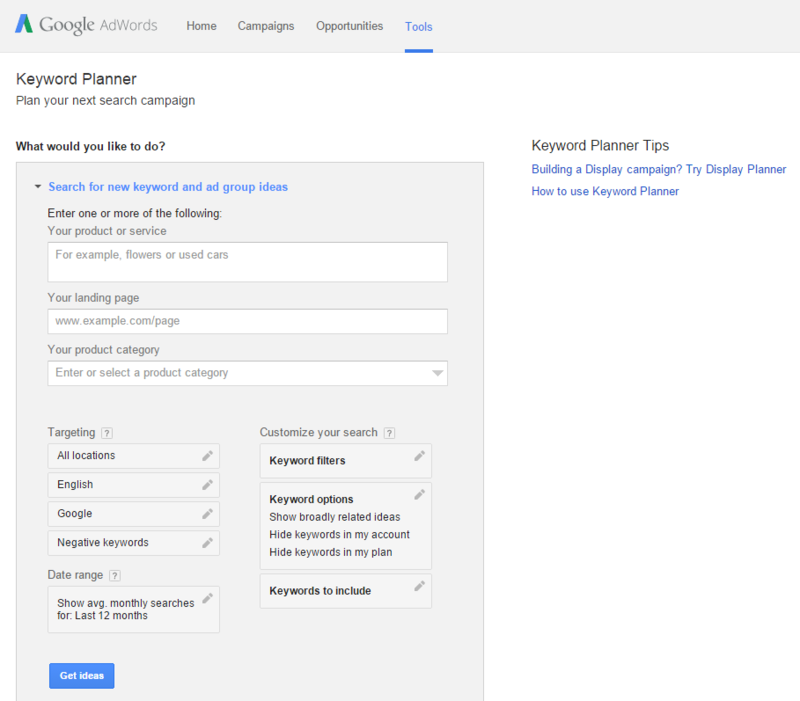 Want to know how you’re faring in the keyword department? 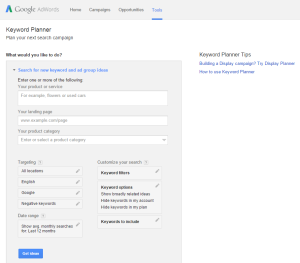 Do a little bit of competitive keyword research by using Google’s keyword planner tool (found in Google Adwords) and entering in your competitors’ websites. You can see how you rank over them (or under them) for your most important keywords and you can use this information to build a strategy to increase your keyword rankings. None of these tricks of the online competitor tracking trade are complicated, nor are they time consuming. But they are easy ways to make sure that your business and marketing efforts are effective and – you know – better than your competition.